This thinking was refined later by Hallpike (1969); “(long hair) is associated with being outside society and that the cutting of hair symbolises re-entering society, or living within a particular disciplinary regime within society”. He equated the cutting of hair to social control – if you are in the army or are a convict you have short-hair, symbolic of discipline. Although, it’s not as simple as long or short, hair styles can offer different symbolic interpretations. Historically, the Spartans famously had their hair cut short in the front and the back was grown long as possible, so that if they ran from battle it would be easier for their opponents to kill them. One of the major religious disputes between the Celtic church and Rome was the ‘tonsure’ -how the hair was cut ; this was a dispute about the right way to communicate celibacy (the tonsure was symbolic of broader differences). This is a much older symbolic theme that Hallpike is evoking; one of the oldest is the story of Gilgamesh and Enkidu. In this story Gilgamesh, was an oppressive king and his subjects complained to the gods. So the gods created an equal in Enkidu to distract him. Enkidu, who is covered in hair and lives in the wild amongst animals: his opposite. The theme here is that civilized man controls his hair, the hirsute are closer to nature and the wild. In Lord of The Flies, author William Golding uses a similar allegory, with the boy’s hair growing and becoming tangled and matted on the Island. The only one whose hair that doesn’t change is Piggy – hair that remains short and clean as he clings to his morals and doesn’t become wild. Hair is also a common descriptive difference between Tarzan and the Apes for similar reasons – highlighting civilization vs nature. 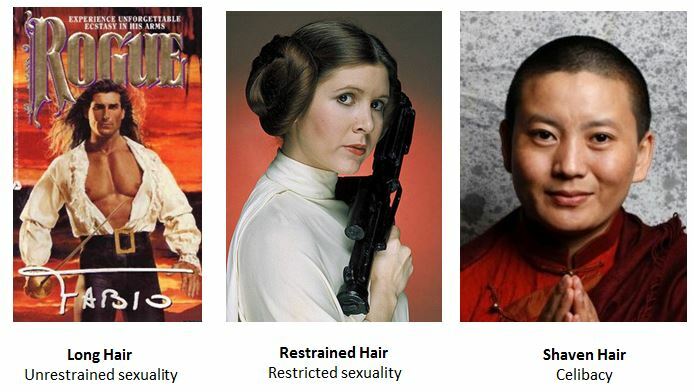 Anthony Synnott (1987) suggested that hair created its meaning in a system of oppositions, two of these are: on your body or between different genders. The example points out that while women depilate from their legs and underarms, they grow their hair long. The opposite of this is true for males, who show off their body hair and keep their hair short. There are a couple of observations here. Firstly, publishing in 1993 that he couldn’t foresee the impact the metrosexual movement would have on men in man scaping. Women are still depilating, along with male behaviour; progressing to the point of virtually making instances of venereal crabs extinct. Synott also suggested that oppositions could occur between ideologies in terms of hair symbolism. In Jewish and Muslim traditions , males are forbidden to cut their beards, whereas in other belief systems, clearly no mandate exists. This is a way of creating cultural boundaries, food is another that was practiced by all people-of-the-book. There are also specific conditions that guard the beard and hair in eastern cultures . These strict conventions become signs that lead to stereotypes of ethnic groups, not only signs of inclusion but also ultimately exclusion. The wearing of beards has a diachronic function in society that communicates different messages of masculinity. These are subject to the culture and trends of the day. There is a consistent theme that the cutting-of-hair is more civilised as you would expect versus just letting it grow out in the wild. Perhaps the best way to explore how beards are being used today would be to audit some of the ads that have this as a core focus, as a reflection of contemporary society which shall be examined in the concluding part of this discussion.